so would the rest of us ... my knees ain't what they used to be ;). *I* would be in heaven! seriously, how fun! i'd slide down that every day! wow - that would have been a more comfortable than bumping down the stairs on our bottoms when we were kids! 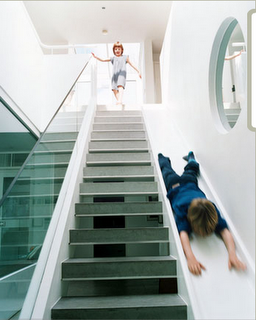 I would love to have slide instead of stairs especially when I am running late. Now that looks like endless hours of fun for the whole family! When I was 6 my older brother and I used to do this with a couch cushion right on the steps. A little bumpy but fun, fun. oh I love this! You've got good stuff on here.